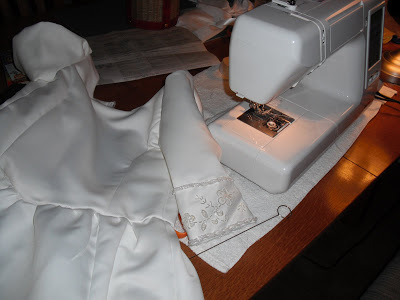 It started with a dress I wore nearly 10 years ago. When I married my husband. My wedding dress. 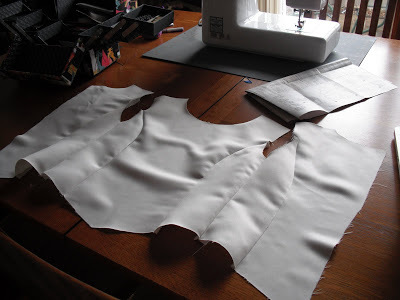 Could it be made into a First Holy Communion dress? I wondered. How wonderful it would be! 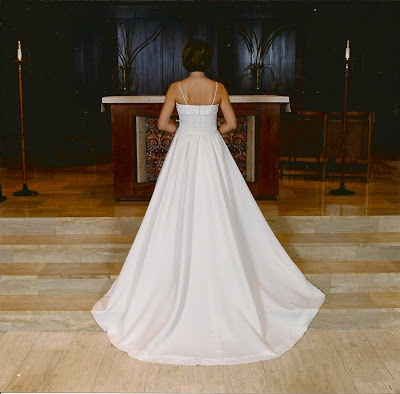 Could the dress that I wore on the day Greg and I began life together be transformed into a dress my daughter could wear on the day she receives Jesus for the very first time? Sacrament to sacrament. Grace to grace. Passing on. Tradition. Part of me. Part of her. For it has sat in my closet, in the same plastic wardrobe bag it came in the day I picked it up from the wedding-gown shop. And I have always wondered what I will ever do with my dress. Too nostalgic to part with it. Yet trying to keep the clutter at bay. As I thought about the idea more and more, I grew excited! Perhaps this transformed dress could be worn not only by my oldest daughter, but by all four of my daughters … and maybe even my granddaughters, too. Part of me could be part of all of them. Sacrament to sacrament. Grace to grace. Passing on. Tradition. I loved the idea of a First Holy Communion dress made out of my wedding dress. To be passed down. 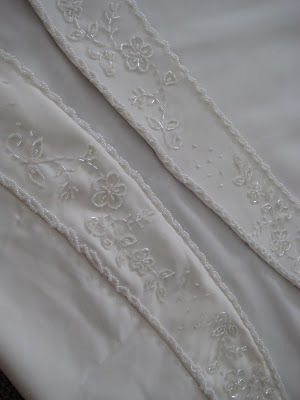 After all, the Baptismal gown they all wore was worn by me and made by my grandmother, too. 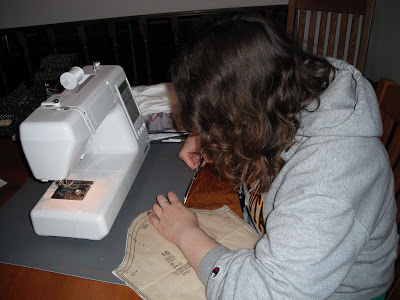 With only a smidgen of sewing ability, I consulted my cousin Jenny to determine if my idea was possible. She went to college for apparel design and development. If anyone would know if my idea was actually doable, it was her. And her response was yes! And she even agreed to help me do it for me. My aunt, her mom helped quite a bit, too, from what I am told. We met. We measured. We cut out the pattern we found at JoAnn. 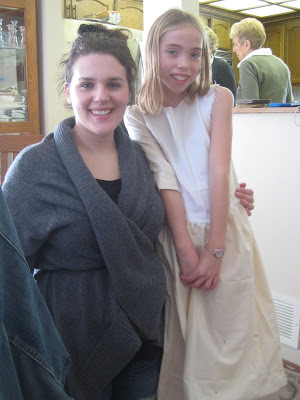 She made a mock-up dress out of muslin. Yes, she really is professional! 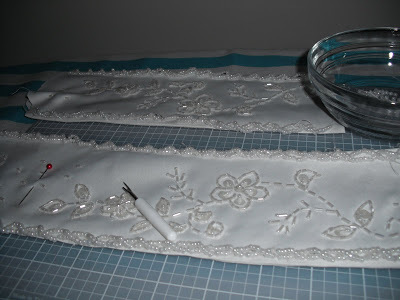 She modified the mock up before cutting into the train of my wedding dress. We had another fitting on Easter Sunday. It was a little big, so she took it in a bit. And made a few other alternations. 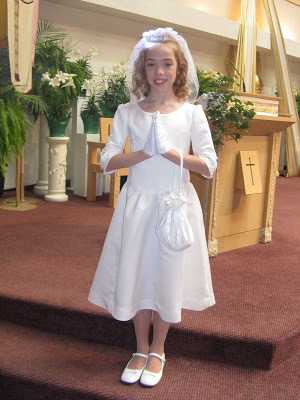 It touches my heart so much that the dress I wore for my wedding was worn by my daughter this past Saturday for her First Holy Communion. The day was already emotional, but this made it even more so. 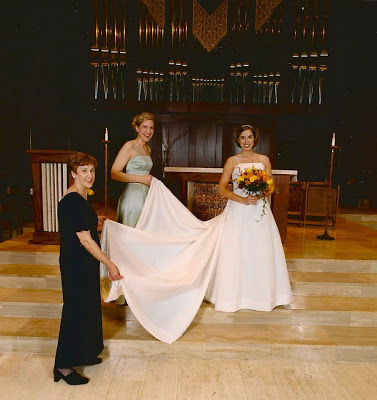 And this dress will be passed on and worn by my other daughters, too! Maybe not for their wedding day, but for the most important day of their lives—for their First Holy Communion, the day they first meet Jesus in the most intimate way possible. Thank you, Jen and Aunt Anne! You really gave us such a gift. How will we ever repay you? The dress is beautiful, Sarah. How very touching that you were able to put aside your attachment to your wedding gown to pass it on in a more special way. I just know that is something our Blessed Mother would have done. Oh, my gosh, I cried through this whole post, how beautiful! Oh, the way you wrote it too, truly a treasure to be passed down for many generations! 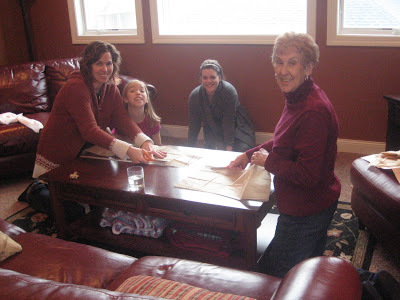 this was a beautiful idea and great family heirloom that you created. the dress is breathtaking and wonderfully modest. thanks for linking this up to the First Communion Joy party that I'm hosting. i'm sure you will inspire many future communicants. Lovely! What a wonderful tradition you have started! THIS is AWESOME! What a wonderful job, a legacy…so touching! Your daughter looks radiant…and a part of something special. Anna is so lucky to have you for her Mom — the dress is beautiful, she looks STUNNING and I know how happy you all must have been on this perfect day! Oh, my, that is so beautiful! What a lovely legacy! Thanks for sharing!! What a wonderful idea; it turned out lovely! I tried desperately and in vain to leave a comment yesterday, but Blogger was mean to me. Anyway, I am in total awe! That s amazingly beautiful in every way! I love this! Beautiful idea, beautiful dress, beautiful memories being made. oh wow. The dress is beautiful Sarah. I just so love the idea of passing it on. My mother made my brothers baptism gown and we all used it. All the grandchildren have used it too. I just love the idea of passing it on. 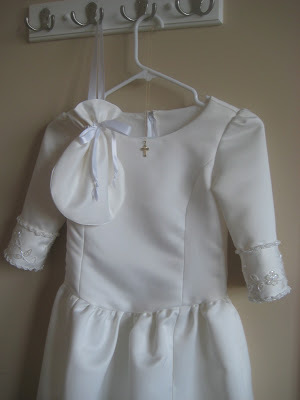 I really hope our grandchildren will be baptised in the same gown too. I had tears in my eyes just reading this. I know this is an old post but it caught my eye tonight. I love this beautiful idea. A memory to cherish forever. 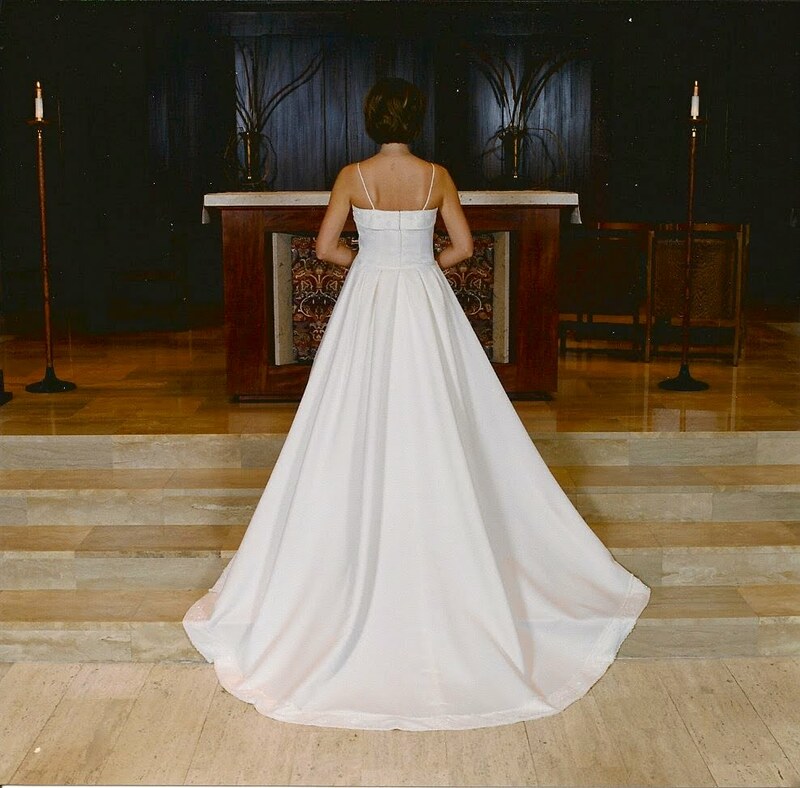 Christ is often referred to as our bridegroom, how fitting that your daughter should be wearing the fabric from your wedding dress when she receives him for the first time. You are truly an inspiration!